In service since 2001, over 150,000 AmSafe Seatbelt Airbag Systems are in service on more than 100 airlines. 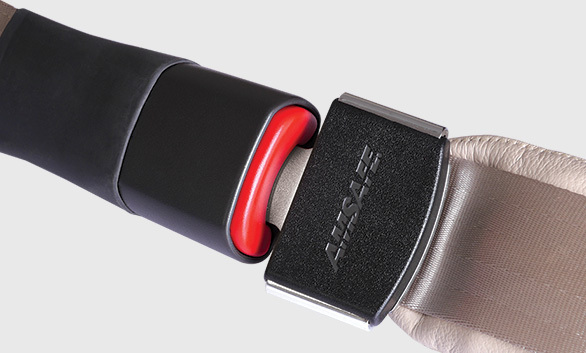 Most general aviation aircraft have AmSafe's® Seatbelt Airbag System installed as standard equipment including Cessna, Cirrus, Mooney, Diamond, Air Tractor and Embraer Ipanema. AmSafe can also retrofit most older aircraft with this state-of-the-art airbag technology. Since being fielded, the AmSafe Seatbelt Airbag System has saved dozens of lives and prevented countless injuries. Continually evolving and advancing aviation occupant safety requirements need the most advanced restraint systems to meet compliance. The AmSafe Seatbelt Airbag System is used in commercial aircraft to protect occupants from impact with bulkheads, monitors and forward seat structure. Business Jet and high end turboprop aircraft use the seatbelt airbag system to protect pilots, co-pilots and passengers. The system is used in general aviation aircraft in the pilot, co-pilots seat to protect occupants from impact with glare shields, instrument panels and control yokes, as well as passengers from forward impact. The AmSafe Seatbelt Airbag looks and operates like a standard seatbelt. The airbag is stored in the lap belt portion of the 2- and 3-point restraints and in the shoulder-harness section of the 4- and 5-point systems. When the sensors detect an impending incident, the seatbelt airbag deploys up and away from the seated passenger – adults and children, large and small – and provides protection to the head, neck and torso. The AmSafe Seatbelt Airbag helps meet the 14 CFR Part 25.562 requirements for pilots and passengers in commercial aircraft, and 14 CFR Part 23.562 26g requirements in general aviation pilot / co-pilot seats. The system provides the additional safety needed in a survivable impact. As the world leader in crew and passenger restraint systems, AmSafe has dedicated continuous support and service centers located around the world – you can depend on AmSafe to provide you with technical expertise for your restraint requirements. "Over 150,000 AmSafe Airbag Systems are in-service on over 100 airlines."